Victoria House01263 715779work01603 870304fax Self-cateringVictoria House is a lovely 1870's detached property with the traditional Norfolk brick and flint exterior. • Rooms: 3 bedrooms, 1 bathroom, 1 kitchen/dining room, 1 sitting room, 1 snug, 1 cloakroom. • Luxuries: DVD player, Flatscreen TV. • Outdoors: Patio with garden furniture. • This property can be booked in conjunction with 1586 providing accommodation for 7 people. 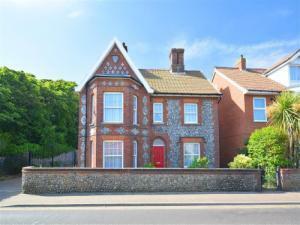 Victoria House is a lovely 1870's detached property with the traditional Norfolk brick and flint exterior.